I'm so proud of how amazingly the dinner I made tonight turned out! I'm leaving in two days for Europe so I didn't want to get all the usual produce I get from the market so I bought this cool bag of little Brussels and sliced mushrooms. I melted coconut oil in a large pan, added the liquid from a jar of salsa because I didn't have any tomato paste, I chopped four tomatoes and let it all summer for a bit. 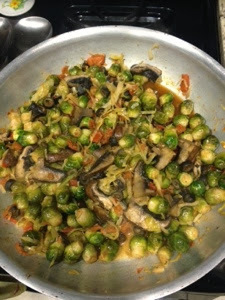 I added chopped black olives, the bag of sprouts, and chopped green cabbage. 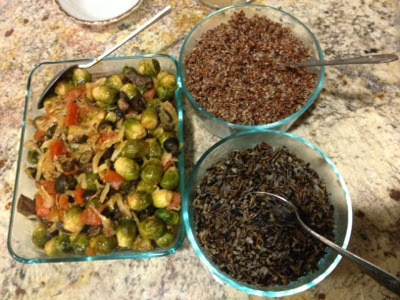 Later I added in the mushrooms and let it all meld together while I cooked wild rice (it took like 45mins!) and red quinoa. It was amazing!